Proudly aligned with the Unified International Taekwon-Do Federation under the auspices of Grand Master Hwang Kwang Sung, Tong-Il Taekwon-Do Australia continues it's strong foundation in the Art in it's purest form. Unified ITF is a modern thinking organisation continuing the teachings of the late founder of Taekwon-Do, General Choi Hong Hi. International Recognition is afforded to all members and Certification for Degree Rank from First Dan through Ninth Dan, Examiner and Umpire classes A, B and C are afforded to our members as appropriate. The Unified International Taekwon-Do Federation was founded to maintain the core values as General Choi Hong Hi intended, including his eternal legacy, the Art of Taekwon-Do. 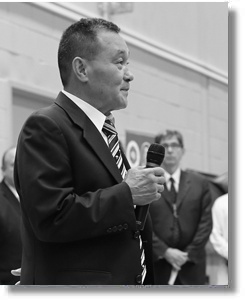 Grand Master Hwang Kwang Sung is the President of the Unified International Taekwon-Do Federation and served in several prominent roles in the ITF under General Choi Hong Hi. Grand Master Hwang faithfully followed the teachings of General Choi as extensively and thoroughly as he was able. Grand Master Hwang fervently believes that Taekwon-Do as the General taught it should be preserved and the various ITF systems be unified once again. To that end, Grand Master Hwang has founded the Unified ITF to continue this legacy and everyone true to Taekwon-Do are invited to partake in this effort. Grand Master Hwang has a long and decorated career in Taekwon-Do with General Choi Hong Hi. 1971 marked the year Grandmaster Hwang was invited to the US and first taught an accredited class at Manchester Community Technical College, and then one year later in 1972 he opened his first Taekwon-Do school. In 1974 , Grandmaster Hwang graduated from the first International Taekwon-Do Federation Instructors course held by General Choi, Hong Hi in Montréal Canada. He also graduated from the ITF Umpires course. Grandmaster Hwang also happens to be one of three Grandmasters (9th Degree black belts) ever promoted by General Choi, Hong Hi. The others being Grandmaster Rhee Ki Ha of the UK, and Grandmaster Charles Sereff of the US. Grandmaster Hwang has served as Director of the USA Junior Taekwon-Do team every Junior World Championships since 1990 and was the 1989 and 1992 USA Senior Taekwon-Do Team Director. Grandmaster Hwang served as special assistant to General Choi, was the Official Spokesman of the ITF, served as Chairman of the ITF Promotion and Merger Committees and additionally, as Secretary General of the ITF. Grandmaster Hwang currently oversees many Instructors, Master Instructors, and Schools throughout the world. He travels and gives seminars in places such as Aruba, Australia, Canada, Greece, Italy, India, Ireland, Mexico, the Philippines, South Africa and United Kingdom. The Unified International Taekwon-Do Federation and by extension, Unified ITF Australia under Grand Master Hwang's guidance, strive to keep General Choi's Teachings alive and as true to it's original form as was intended by General Choi Hong Hi. As one of Three Grand Masters personally promoted by General Choi, the heritage and prestige of such recognition is well established. International Recognition and Certification for Degree Rank from First Dan through Ninth Dan, Examiner certification for International Ranks (4th Degree) and above and Umpires class A, B and C are afforded to our members as appropriate. These certifications are from Grand Master Hwang Kwang Sung personally, the President of the Unified International Taekwon-Do Federation. As an associate of Unified ITF Australia, we have priority access to the resources both domestically and internationally under Grand Master Hwang's humble guidance. Hand in hand with International Recognition and Certification is a quality assurance process to protect the integrity and prestige of such qualifications. The UITF sanctioned seminars, workshops and courses not only work towards ensuring such quality but attract discounts for it's members in a friendly, non-confrontational environment. Engagement is ongoing and support in your personal development is offered at a pace you can meter. Your progression in Taekwon-Do, whether it be at the cutting-edge elite or as a casual practitioner, is yours to control. Assistance with your school in fitness and personal training regimens along with marketing and administration are also offered both as a professional service and shared among our members. Unified ITF Australia has a perpetual invitation to anyone with a genuine desire to learn (and teach) true Taekwon-Do as laid down by General Choi Hong Hi. With the fracturing of Taekwon-Do as presented by various interest, the real fear is the erosion of Taekwon-Do in it's purest form. Since the General passed away in 2002, the emphasis for Grand Master Hwang is on maintaining the Purity of the General's Taekwon-Do. This legacy is utmost and the Unified ITF has an extensive list of talented and experienced Masters and Grand Masters throughout the world willing to guide and educate anyone interested of the core teachings and values of Taekwon-Do. You as a member become an integral part of this very important legacy. The skills, values and experience you stand to gain are world class and you in turn become a valued proponent of the True Art of Taekwon-Do. Your membership allows us the privilege to host many of these Masters and Grand Masters on our doorstep to personally deliver their extensive knowledge, experience and history with General Choi and his beloved Art. Contact Us for further information. The politically charged and the self-interested need not apply.